Equipped, but not overly so. On Sunday I went on the year's inaugural snowshoe in the mountains north of Vancouver. Winter is now upon us, and with it all of winter’s traditions. Someone will go hiking just before a blizzard hits, and will be found next spring. Young (and almost invariably male) skiers will sneak into the backcountry and need to be rescued. Snowmobilers will attempt highmarking and predictably trigger avalanches from which they will need to be dug out. And down in the cities, people will snort at their foolishness and repeat the refrain that those who go out of safe boundaries ill-equipped should be billed the cost of their rescue. I will be one of the ones rolling my eyes at some of the stories (“Safety equipment? Umm, we had a cell phone…”), sorely tempted to join the chorus. Bill them! Leave them! Serves them right! Give them a Darwin Award! Hopefully I will hold back. Canada is a more urbanized country even than the USA. Increasingly, Canadians live within their cities and seldom venture out. Those who do are often regarded strangely. “Bit of a loner. Likes the bush.” And those who go out there, beyond the television screens and the cell reception, seem to be doing something both pointless and foolish. If something goes wrong, well, why is that my problem? But we seldom hear calls for a cessation of funding to rescue people from other mishaps – many of which are caused by our own actions. 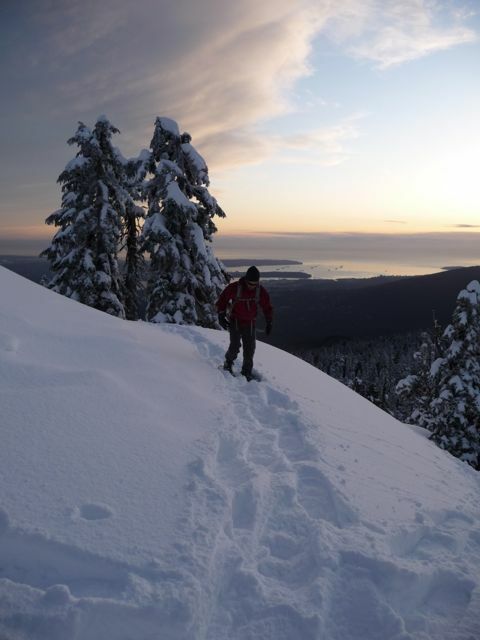 Snowshoeing, downtown Vancouver in background. The person caught in a motor vehicle accident while driving to the supermarket 4 blocks from home. The person who suffers a heart attack after eating at fast food restaurants daily for many years. The person who dutifully works 16 hours a day at their desk job, striving to pay off the mortgage on the family home, and lapses finally into depression. The person who remains safely ensconced at home, watching others live fictionalized lives on television, and trips on an unpopped kernel of corn. So why the smirks and calls for repayment from those who run into trouble in the backcountry? Perhaps it is because the social norms are changing. Wilderness travel, backpacking, backcountry skiing are becoming marginalized rather than valued. It’s easy to criticize those other people, not like me, who get into trouble doing things I would never do. We have begun to fear our country. Once a much-loved asset, the wilderness is now a threat. 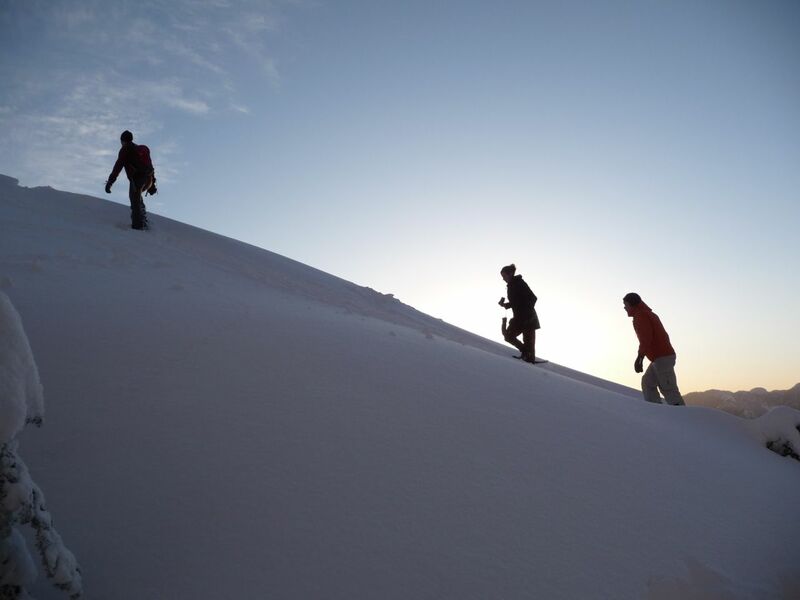 It’s a dangerous place that only a few outdoor-expedition geniuses are qualified to handle. But perhaps the greatest threat to Canada – and the world – is the assault on our natural environment. How can we expect people to care for something they have never seen, something they fear, something that seems to want to kill them? For people to appreciate what we have, they must see it and walk through it. Then they might be more inclined to think before destroying it. We are in no danger of bankrupting ourselves looking for young people who venture beyond their abilities. We are in much greater danger of irrevocably damaging our environment – and our physical and mental health – by ignoring the consequences of our lifestyles on the world and on ourselves. Sure we need better training. We need to remind people that the mountains are not equipped with safety rails nor are they designed by Disney. We should be encouraging more wilderness education as a standard part of our school system. But we don’t need to encourage even more fear of the natural world than our urban dwellers already have. Hmm, Randy. I absolutely agree with the point you make about needing education of our outdoor enthusiasts. No doubt. It is not uncommon for an individual to be driven to participate in activity well beyond his/ her skill level in the wilderness. It's adventerous, after all. PLBs, cell phones and improved technology have made the wilderness a seemingly safer and smaller place to people who want to experience it. As a 5 year SAR veteran and therapist, myself, I support the continued use of government resources at no cost to those in TRUE need. However, for the individuals who lack experience, skill and knowledge and find themselves in a dangerous situation requiring rescue, their naive and selfish attitudes put handfulls of volunteers and professionals at risk. What oftentimes goes unnoticed are the individuals who put THEIR lives in danger to rescue those who don't know any better. Volunteers leave their dinner tables, birthday celebrations and other events to help someone "in danger". Deputies are taken off the streets to oversee these operations, leaving less protection and services available in urban areas. What I propose is a "stupid hiker" law. Those who are in need of rescue and are deemed irresponsible are charged for the rescue. Out on a 10 mile hike in Arizona in July with only a liter of water and you need help? You'll be saved...and charged $10,000 afterward. You're a seasoned hiker who twisted his ankle? You've splinted it and are attempting self rescue? We'll come get you, and you won't have to pay a penny. I'm sympathetic to this view. But would you also propose a "stupid eater" law for those who develop metabolic problems as a result of poor diet, a "stupid renovator" law for those injured on the job, a "stupid sitter" law for those who get no exercise, and so on? I don't mean to sound sarcastic or cutting there, and perhaps the point is irrelevant if you live in a country without national health care. But it seems there are only certain kinds of poor judgement for which we propose billing the victim. I'd be reluctant to bill the hikers unless we were willing to bill the others, and I would be opposed to those other moves as well, so that leaves me in the position of opposing the hiking one.